Hello Gyanians, आज हम बात करेंगे WordPress Blog के Manually Backup के बारे में और सीखेंगे की कैसे आप अपनी hosting cPanel की help से अपने WordPress blog की files और database का manually backup ले सकते हो? अपने blog का समय-समय पर Backup लेते रहना blogging का सबसे ज्यादा important काम होता है क्योंकि पता नही कब और कैसे आप अपने blog के data (files, settings, database, themes, plugins) से हाथ धो बैठो. 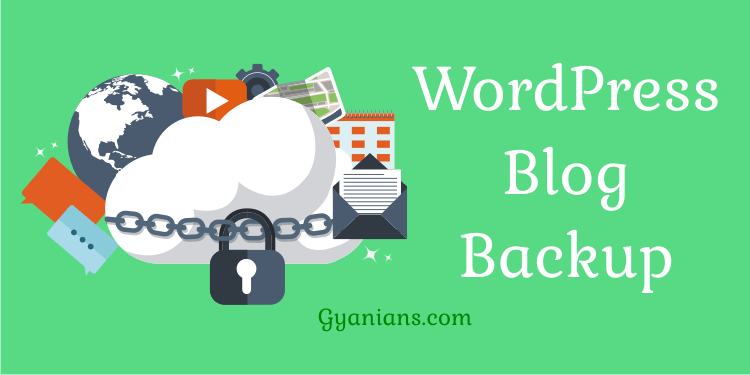 WordPress blog का manually backup लेना क्यों जरुरी है उसकी कुछ वजह में आपको बताता हूँ. कोई hacker आपके blog को hack करके आपका पूरा data delete या infected कर दे. आप अपने blog की किसी files में कोई changes कर रहें हो कुछ गलत changes हो जायें या आपसे कोई file गलती से delete हो जाये. आप अपने blog को एक hosting से दूसरी hosting पर transfer करना चाहते हो. ऊपर बताये गये points के अलावा WordPress blog के manually backup लेने के और भी reasons हो सकते हैं और backup लेने से इनमें से किसी भी condition में आप अपने backup को restore करके अपनी site को दुबारा से live कर सकते हो. WordPress Blog के Files और Database का Manually Backup कैसे लेते है? किसी भी WordPress blog के 2 parts होते है files और database. WordPress files में आपकी WP core files, themes, plugins, images और कुछ other files होती है. WordPress database में आपकी posts, comments, users settings होती हैं. 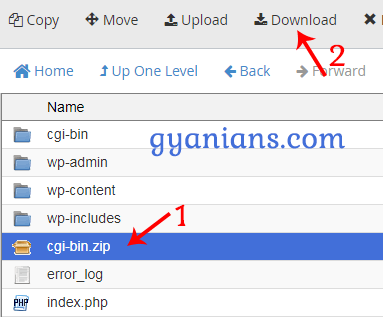 किसी भी WordPress blog के full backup के लिए आपको इन दोनों यानी files and database दोनों का backup लेना होता है और WordPress backup लेने का ये काम आप plugin की help से, cPanel के backup wizard की help से या manually methods से कर सकते हो. WordPress blog के files and database का manually backup लेने के लिए मुझे सबसे best method लगता है manually backup method और ज्यादातर seniors bloggers भी manually method से backup लेना suggest करते हैं. WordPress blog के files and database का manually backup लेना बहुत ही आसान होता है और फिर उस backup को restore करना भी बहुत आसान होता है. WordPress blog के files and database के manually backup को restore कैसे करते है ये हम अपनी next post में सीखेंगे. Read: WordPress Blog Ko Old Hosting Se New Hosting Par Move Kaise Kare? Read: Single Web Hosting Par Multiple Domain Websites Kaise Host Karte Hai? Read: Live WordPress Site Ko Localhost Par Kaise Copy Kare? WordPress Blog की Files का Manually Backup कैसे लेते है? Step 1: सबसे पहले आप अपनी hosting के cPanel में login कर लीजिये और फिर File Manager पर click कीजिये. Step 2: अब आप public_html folder के अंदर जाकर Select All checkbox को select करिये और फिर Compress option पर click करिये अब आपके सामने Compress का pop-up आएगा और अब आप Compress Files button पर click कर दीजिये. Last Step: अब आपको public_html में एक .zip file नजर आएगी जिसे select करके आपको Download option पर click करना है. File को download में कुछ time लगेगा depend करता है की आपके blog पर data कितना है. WordPress Blog के MySQL Database का Manually Backup कैसे लेते है? Step 1: अब आपको अपने WordPress blog के database का backup लेना है और इसके लिए आपको cPanel में phpMyAdmin option पर click करना है. Step 2: अब आपको phpMyAdmin में अपना database select करके Export tab पर click करना है और फिर Go button पर click करना है. कुछ ही देर में आपके database का backup भी download हो जायेगा. Final Words: इसी तरह समय-समय पर आपको अपने WordPress blog के files and database का manually backup लेते रहना चाइये और पुराने backup को delete करके new backup को store रखना चाइये और समय पड़ने पर उस backup को use करना चाइये. Read: Font Awesome Icons WordPress Blog Me Kaise Add Kare? Read: WordPress Child Theme Kaise Create Kare? Read: Speed Up WordPress with PHP 7 – PHP Version Upgrade Kaise Kare? Hello Gyanians, मैं आशा करता हूँ की आपको ये WordPress Blog Ke Files and Database Ka Manually Backup Kaise Lete Hai post पसंद आई होगी. अगर आपको इस post से related कोई सवाल या सुझाव है तो नीचे comment करें और इस post को अपने दोस्तों के साथ जरुर share करें. Neel Bhai aapne bahot hi acchi jankari provide ki hai. Wow sir bahut hi simple tarike se aap ne samjha diya . Very nice post sir thanks. Sir mere blog ka 1st backup matlab zip file wala backup 457 mb ka huwa aur sql backup 8 mb ka huwa dono download kar diya. ab agar mera blog hack huwa to mai use recover kar sakta hu kya? brother jaise blogspot blog par post pages comments images ko full backup lene ka option diya gaya hai thik waise hi wp dashboard me iska option nahi hai kya ? hosting trnsfr wali padhunga…..bht hi acchi blog h aap ki……. brother mujhe aaj bhi aapke new post ka intezar hai jisme aap plugin ki madad se wordpress blog ka backup lena bataye….